Begin by preheating the oven to 400 degrees. Next, toss the cubed butternut squash in the oil, sugar, paprika, salt, coriander, cumin, black pepper, nutmeg, and cayenne pepper. Then take a rimmed sheet pan and spread the squah pieces evenly. Bake the squash for about 10 minutes, rotate the pan, and continue baking for another 10 minutes. While the squash is in the oven, make the dressing. Combine the vinegars, mustard, honey, lemon juice, salt, and pepper in a glass jar. Add the oil last, secure the jar's lid and shake well. 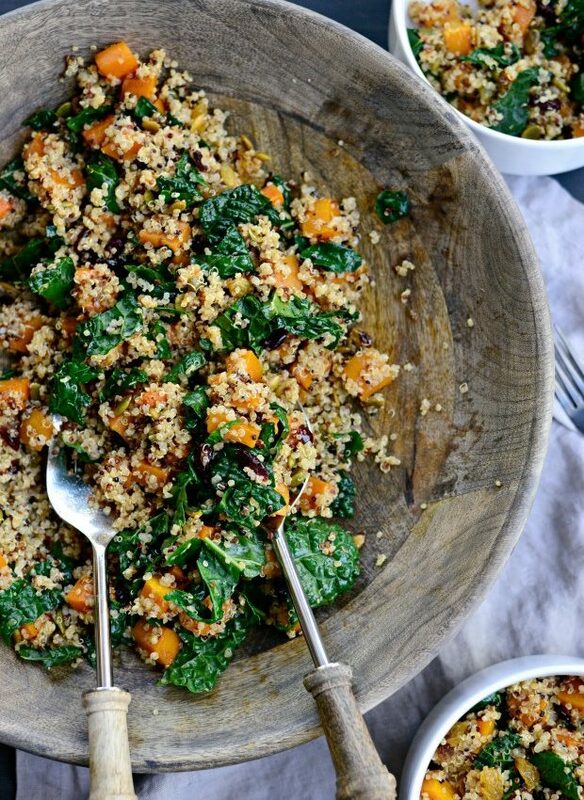 Then place the chopped kale, cooked quinoa, roasted squash, raisins, dried cranberries, and pepitas in a large salad bowl. Use a pinch or two of kosher salt and freshly ground black pepper to season the salad. Once the salad is prepared, drizzle with 1/4 cup of the dressing or more to taste. Serve warm. Enjoy! You can have a brand new blog to post on ps1000.com starting at $10 in as little as 5 business days!